« The Funny Thing About Peas…. 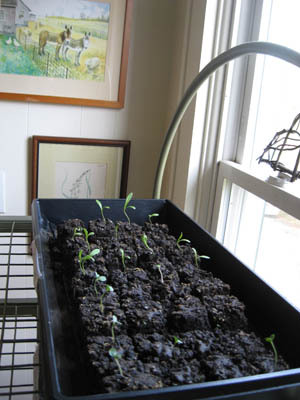 And so it begins: the Seedlings of 2011. 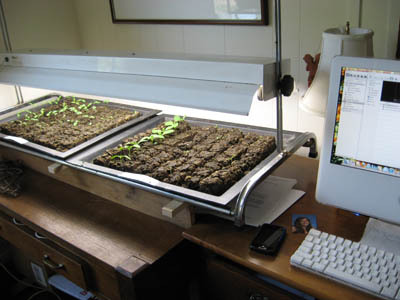 The plant tray with steady, adjustable artificial light is next to my keyboard, and the window is filled with the plant display rack, given by our generous and good neighbors, that holds three more trays. 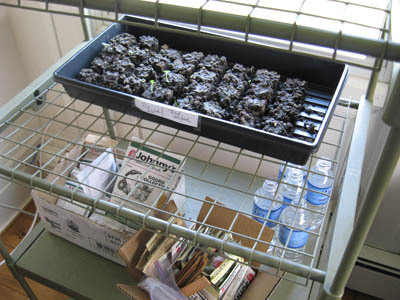 I started herbs, vegetables, and flowers indoors, reluctantly setting aside the “direct seed” packets for planting in the garden when the calendar dictates. This is a supreme exercise in self-control for me. My instinct is to start every plant indoors, but I have so many that I fear I’d be the subject of a new reality show: Seed Starter: The Truth, The Tragedy. A close look at the tomatoes. 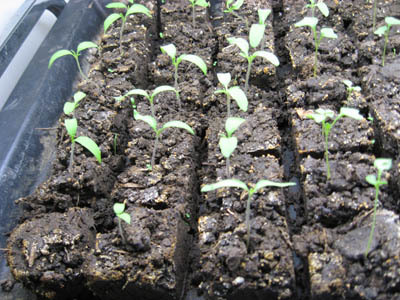 I confess, I am most eager for these seedlings to do well. I can do without anything, except tomatoes. Tomatoes, broccoli, kale and peppers to the left, borage and herbs to the right. 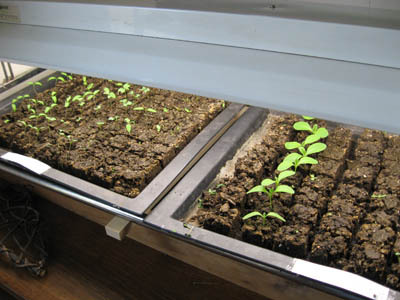 Keeping the seedlings as close as possible. Zinnias in the foreground, calendulas towards the wall, both arching and waving towards the sunlight. The hollyhocks start to emerge, with my boxes of seed packets and oh-so-elegant watering vessels below. I start and end each day with them, checking on their progress, thinning out the weaker individual in each block (and I will never feel entirely comfortable with culling), and watering when needed. They are with me for such a short time, so I appreciate every minute. P.S. Take note of the new “widget” (that’s what “wordpress” calls them) to the right: Chipmunk Scorecard. I will keep track through the season of who is winning the Amy vs. Thieves contest. I trapped one chipmunk already, and relocated him, much to MacKenzie’s dismay. No plants have emerged in my garden, so there has been no opportunity for the chipmunks to score. The 1-0 score, while in my favor, is not something to brag about. Yet. “Every seed is awakened, and all animal life. I do not have a green thumb, in fact I have been accused of not only having a brown one but some would say it is even black. I can’t get anything to grow for long. Hence the reason I left the Peace Lily at Questar when I left. Please take care of her for me. I’m not sure who is the Keeper of the Lily at Questar, but I will check on it for you! Please tell your daughter that she should never worry about mothers that laugh out loud. The time she needs to worry is when a mother goes over 24 hours without laughing. That could mean Trouble, or even Major Danger For Daughters. We walk a fine line, we moms. BTW, Lily may need her own intervention. She may be getting cramped in that pot and need to be split if you could manage that without too much effort. I will seek out Lily on Monday and report on her condition! ps. congrats on the first relocation success. Self control? 228 soil blocks? I think you need an intervention! And I’m right there with ya. There isn’t a square inch in the house that doesn’t have flats. Maybe a greenhouse? Of course, that might be considered a another episode of “seed starter”–LOL!